The chart above features all the characters of the fictional language, Triverse. ‘Triverse’ is the language spoken by Kongwai and Q.Q. 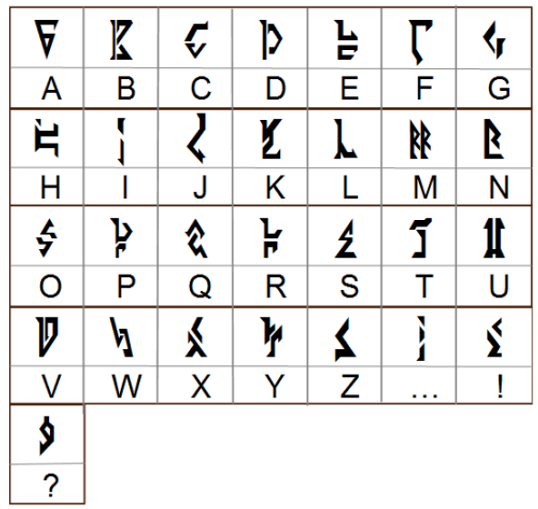 in Tales of Innocence R. Triverse doesn’t have any established grammar or even words (it would probably be more accurate to call it a cipher rather than a language); if you can speak and write Japanese, then you’re only a few steps away from being able to speak and write Triverse as well. Let’s have a look at what steps you need to take to get there. QQ HA URESIINO! IKURA OREIWO ITTEMO TARINAIWA! HONTOUNI TASUKATTA ARIGATO! 3. The third step is to take your romanized sentence(s) and turn it backwards. There seems to be no solid rules for where spaces should be placed; instead, they’re used as a means of making pronunciation easier. The most common segmentation I’ve seen has been by word (with particles also commonly being treated as their own word), but the in-game Triverse goes against this several times. The only rule concerning spaces seems to be ‘put them where it seems to make sense’. However, one rule is that if a flipped word ends in a consonant, the consonant will be pushed to the start of the next word rather than at the end of the first. ONIISERU AH QQ! AWIANIRA TOMETTIOWIE ROARUKI! AWIANIRA TOMETTIOWIE RORUKI! OTAGIRA ATTAKUSA TINU OTNOH! * When sentences are grouped like this, you turn each sentence backwards individually, not as a group. * The ‘push the consonant at the end of the word to the next word’ rule doesn’t apply to words that are at the end of sentences. And there you have it! You’ve gone from Japanese to Triverse in just 4 steps! * Proper nouns such as names aren’t flipped and won’t have additional consonants attached to them (most of the time); when you reach them in the sentence, simply write them with their normal forward spelling. * If you want to translate something from Triverse to Japanese, just follow the steps backwards. * All this information was gathered from various places in the Tales of Innocence R Perfect Guide, with pg. 223 being the primary source.